Army Cadets from Harrow ( Royal Army Medical Corps) and Kingsbury ( Royal Engineers) were among the many uniformed youth groups who provided an Honour Guard for the arrival of HM Queen and HRH The Duke of Edinburgh at the Krishna Avanti School in Harrow today (29th March). 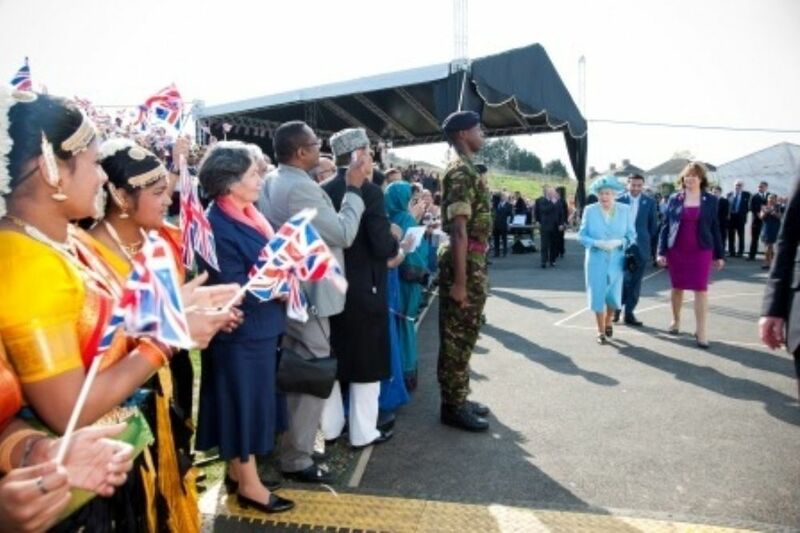 As part of the Queen’s Jubilee tour the Royal visitors were entertained with music, song and dance from a huge range of cultures and traditions. Cadets were on hand to distribute programmes, and to assist some of the hundreds of invited guests. Leader of Harrow Council Councillor Bill Stephenson was most appreciative of the help and support given by the Cadets and Youth Groups and the Armed Forces in the Borough. Both the Mayor and Councillor Stephenson are pictured with the young people as they prepared for their duties. Photographs courtesy of Captain Michael Nolan, PR Officer Middlesex and North West London ACF and Lucy Baker.